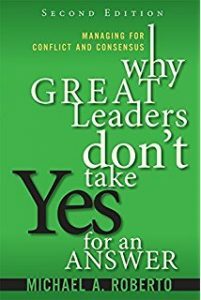 In Why Great Leaders Don’t Take Yes for an Answer (found in the The Library in St. Pete) Professor Michael Roberto explains how the key to making successful strategic business decisions lies in how you design the decision-making process itself. A good process will entail “astute management of the social, political and emotional aspects of decision making” and address or at least understand the underlying biases of the participants. We heard echoes of Professor Roberto in The case for behavioral strategy – an article found in McKinsey Quarterly. Left unchecked, “systematic tendencies to deviate from rational calculations” can undermine strategic decision making. It’s easy to see why: unlike in fields such as finance and marketing, where executives can use psychology to make the most of the biases residing in others, in strategic decision making leaders need to recognize their own biases. So despite growing awareness of behavioral economics and numerous efforts by management writers, including ourselves, to make the case for its application, most executives have a justifiably difficult time knowing how to harness its power. 1. Pattern recognition: includes saliency bias – giving too much weight to recent or highly memorable events; and confirmation bias – the tendency, once a hypothesis has been formed, to ignore evidence that would disprove it. 2. Action orientation: the urge to take action, especially when under pressure, can taint analysis and create overconfidence or overoptimism when an attractive plan presents itself. 3. Stability: in contrast to action biases, stability biases make us less prone to depart from the status quo than we should be. Includes anchoring – the powerful impact an initial idea or number has on the subsequent strategic conversation; loss aversion – the well-documented tendency to feel losses more acutely than equivalent gains; and the sunk-cost fallacy – the irrational dedication to an idea or project created after “sinking” time or money into it. 4. Interests: participants seem to see issues from completely different perspectives, reflecting the presence of different (and generally unspoken) interest biases. The truth is that adopting a sufficiently broad (and realistic) definition of “interests,” including reputation, career options, and individual preferences, leads to the inescapable conclusion that there will always be conflicts between one manager and another and between individual managers and the company as a whole. 5. Social: sometimes interpreted as corporate politics but in fact a deep-rooted human tendency. Even when nothing is at stake, we tend to conform to the dominant views of the group we belong to (and of its leader). This last point is a favorite of ours when discussing what makes great boards great. However well-designed the process of decision-making may be, it’s the ‘robust social systems’ and the members’ informal modus operandi that ensure all those well-designed systems function properly.